AMD today revealed the world’s first hardware virtualized GPU products – AMD FirePro S-Series GPUs with Multiuser GPU (MxGPU) technology. AMD’s ground-breaking hardware-virtualized GPU architecture delivers an innovative solution in response to emerging user experiences such as remote workstation, cloud gaming, cloud computing, and Virtual Desktop Infrastructure (VDI). In the virtualization ecosystem, key components like the CPU, network controller and storage devices are being virtualized in hardware to deliver optimal user experiences, but prior to today the GPU was not hardware virtualized. AMD MxGPU technology, for the first time, brings the modern virtualization industry standard to the GPU hardware. What does this mean? Consistent performance and enhanced security across virtual machines. MxGPU controls GPU scheduling delivering predictable quality of service to the user. Delivers hardware GPU scheduling logic with high-precision quality of service to the user. Preserves the data integrity of Virtualized Machines (VM) and their application data through hardware-enforced memory isolation logic preventing one VM from being able to access another VM’s data. Exposes all graphics functionality of the GPU to applications allowing for full virtualization support for not only graphics APIs like DirectX® and OpenGL but also GPU compute APIs like OpenCL. 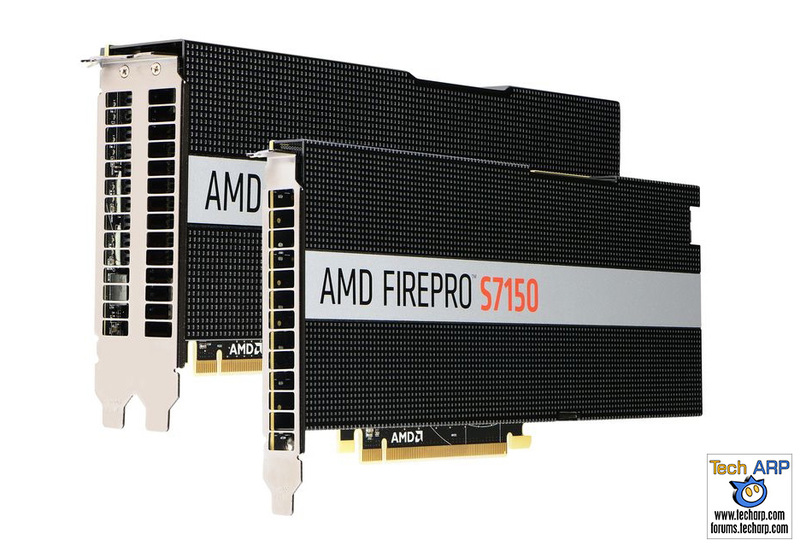 The new AMD FirePro S7150 and AMD FirePro S7150 x2 server graphics cards will combine with industry-leading OEM offerings to create high-performance virtual workstations and address IT needs of simple installation and operation, critical data security and outstanding performance-per-dollar. Typical VDI use cases include Computer-Aided Design (CAD), Media and Entertainment, and office applications powered by the industry’s first hardware-based virtualized GPU. IT budgets can realize support for up to 16 simultaneous users with a single AMD FirePro S7150 GPU card which features 8 GB of GDDR5 memory, while up to twice as many simultaneous users (32 in total) can be supported by a single AMD FirePro S7150 x2 card which includes a total of 16 GB of GDDR5 memory (8GB per GPU). Both models feature 256-bit memory bandwidth. AMD Multiuser GPU (MxGPU) technology to enable consistent, predictable and secure performance from virtualized workstations with the world’s first hardware-based virtualized GPU products to enable users with workstation-class experiences matched with full ISV certifications. GDDR5 GPU Memory to help accelerate applications and process computationally complex workflows with ease. Error Correcting Code (ECC) Memory to ensure the accuracy of computations by correcting any single or double bit error as a result of naturally occurring background radiation. OpenCL 2.0 support to help professionals tap into the parallel computing power of modern GPUs and multicore CPUs to accelerate compute-intensive tasks in leading CAD/CAM/CAE and Media & Entertainment applications that support OpenCL allowing developers to take advantage of new GPU features. AMD PowerTune is an intelligent power management system that monitors both GPU activity and power draw. AMD PowerTune optimizes the GPU to deliver low power draw when GPU workloads do not demand full activity and delivers the optimal clock speed to ensure the highest possible performance within the GPU’s power budget for high intensity workloads. AMD FirePro S7150 has an MSRP of USD $2399 and AMD FirePro S7150 x2 has an MSRP of USD $3999. AMD FirePro S7150 and S7150 x2 server GPUs are expected to be available from server technology providers in the first half of 2016.